We welcome your ideas and suggestions, as well. Let us hear from you by emailing: international@AlamoAreaBSA.org. What is an International Service Team? An International Service Team (IST) is one or more Scouters (adults) who are selected to work as staff at a foreign Scouting event. 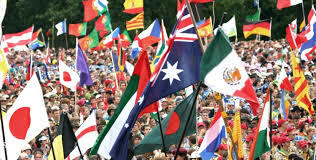 You have the same opportunities for interacting with Scouts and Scouters from other countries, either world wide, such as the World Scout Jamboree or by region, such as a MOOT. Click below to download the PDF newsletter!